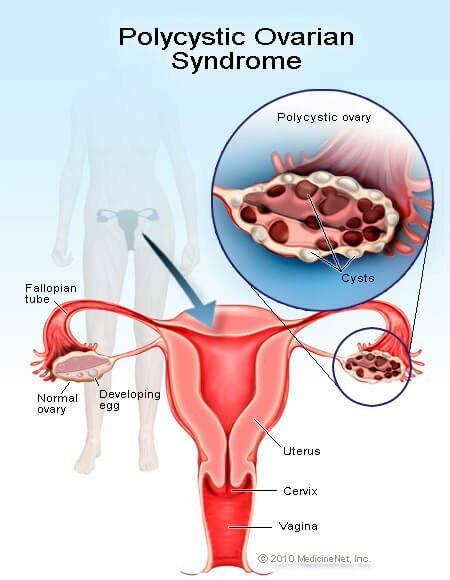 Polycystic ovary syndrome (PCOS) is a set of symptoms due to elevated androgens (male hormones) in females. Ayurveda classifies PCOS as a kapha disorder. The organs responsible for reproduction in the female body are called artava dhatu. The channel that supplies, nourishes and enables the functional action of carrying the ovum to the uterus is called artavavaha srota. All three doshas play important and distinctive roles in the processes behind the female reproduction which includes the ovarian cycle and the menstrual cycle. Vata is responsible for movement of the follicle during the ovarian cycle, the rupture of the ovary wall releasing the matured ovum, the movement of the fimbriae – the finger like projections that guide the ovum into the fallopian tubes and the movement of the ovum towards the uterus. These actions are due to apana vayu, the force behind downward movement from the navel down. Apana vayu is also responsible for the movement of menses during menstruation and the energy behind the downward movement of a baby through the birth canal during labour. The action of the hormones expresses the nature of pitta, the energy responsible for transformation. All stages of the female reproductive process are a result of the interplay of hormones. The spark of intelligence behind the transformation of each stage is due to pitta reflected in the influence of the hormones on the different stages of the ovarian and menstrual cycles. Kapha’s heavy cool qualities nourish the development of the tissues that form and support the reproductive system including the nurturing energy supporting growth of the follicle during the ovarian cycle. It is responsible for the mucosa layer of the fallopian tubes and uterus that protects the tissues from the drying affect of ever present vata. In the GI tract kapha is responsible for the mucosa lining that protects the tissues form digestive enzymes. PCOS is due to kapha blocking vata and pitta, hence movement is obstructed and the transformation process is suppressed. Divide both of these into 30 equal parts. Now boil 1 part every morning in 3 cups of water (approx 150ml) and reduce to 1 cup. Now filter this mixture and add 1cup of cow’s milk to it. Boil the mixture again over a low flame till milk remains. Add 2 cardamoms while boiling. Consume this milk early morning empty stomach. Little sugar can be added for taste. The remaining filtrate of Aswagandha and Arjun can be used similarly in evening. During summer months, Shatavari (Asparagus racemosus var. javanica) can be substituted for Aswagandha. Prepare an herbal tea as mentioned in MEDICINE 2 and consume fresh 3 times a day on empty stomach in morning. Try any one method above to see results within 5 weeks.